UVerse must have accidentally let a Cardinal game through because last night we sat down and actually got to watch the Cardinals hammer the Diamondbacks. It had been a few days since we last watched a Cardinal game, so as we blissfully drank in the offensive displays that usually bore us and watched Lance Berkman’s grand slam shot float over the wall of Chase Field we had all but forgotten the thing that would later ruin the game for us. 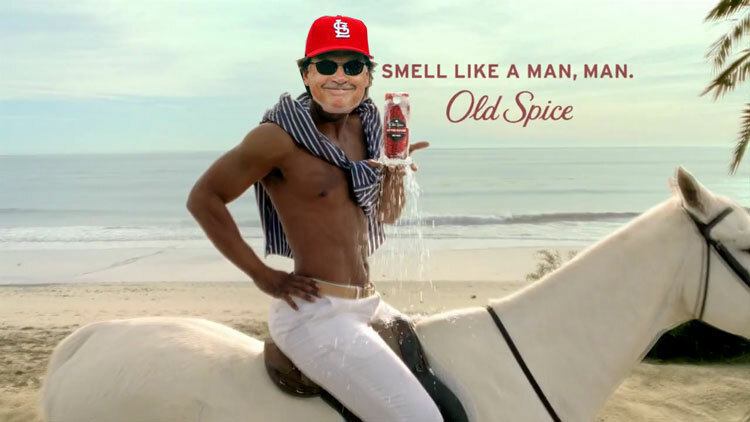 The same thing that has ruined every Cardinal game, despite the outcome, so far this year…no, not Ryan Franklin…it’s those horrible Ray Vinson commercials featuring Tony LaRussa! These things are just the worst. Yeah the acting is the piss poor, but then you throw in the lame high-five handshake, the dialog that makes no sense, Vinson’s voice, and the fact that Tony is protesting a call in a t-shirt and jeans, and you’ve got yourself one of the all time worst Cardinal game ads. We don’t fault Vinson buying the ad or Tony being in it, but why the little fake scene? Can’t Tony just say he would go to Ray Vinson any time he needed whatever it is that Vinson does and let it be over? Tony, if you want to whore yourself out for ads, at least let them be good ones. Might we suggest hopping on a horse? Update: Here’s another one with, as noted by ToastedRav.com’s “The Internet’s” Chris Files, a pitch that takes approximately 6 seconds to get from the mound to the catcher. What a cannon! These commercials are so painful, screwing a bottle full of razor blades and salt water would be a nice break…or maybe even switching to the Cubs game on WGN.